SPDTU08010xD is a high performance C-band tunable transceiver module for 9.95 Gbps to 11.3 Gbps data links over a single mode fibre pair. The maximum reach is 80km1 for a 23dB End Of Life (EOL) power budget. The transmitter is a cooled C-band tunable transmitter (ILMZ), the receiver is an APD (Avalanche Photodiode) receiver. This transceiver module is compliant with the Small Form-factor Pluggable (SFP+) Multisource Agreement (MSA) and hot pluggable. Couldn’t find a specific vendor? 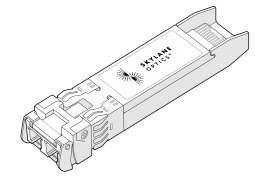 Skylane Optics® is working directly with leading certification institutes, to ensure that Skylane Optics® transceivers are safe and have the smallest possible impact on the environment.